We have been home from Calvert Island for a few days now. I have to say that it was a trip of a lifetime. We saw some of the most spectacular landscapes I have ever seen. 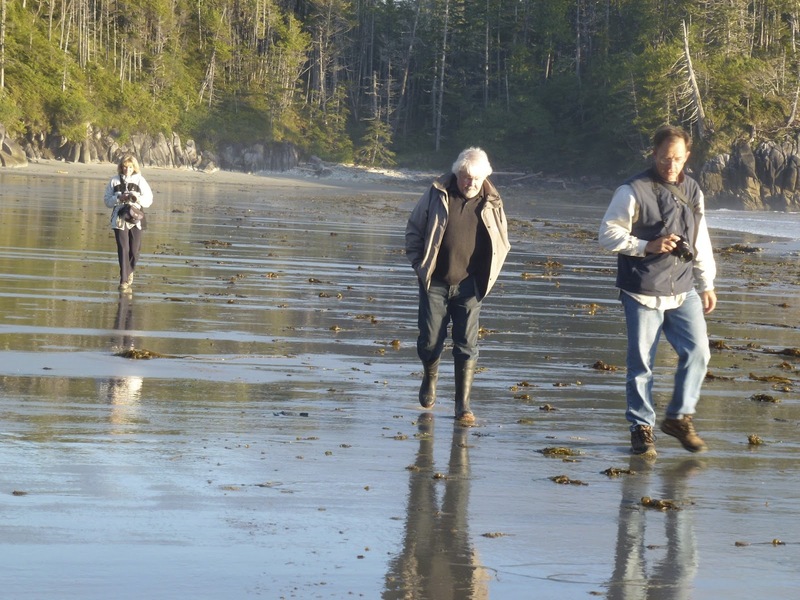 The top photo is of Alan, Mike Svob and Gaye Adams walking on one of the many beautiful beaches on the island. 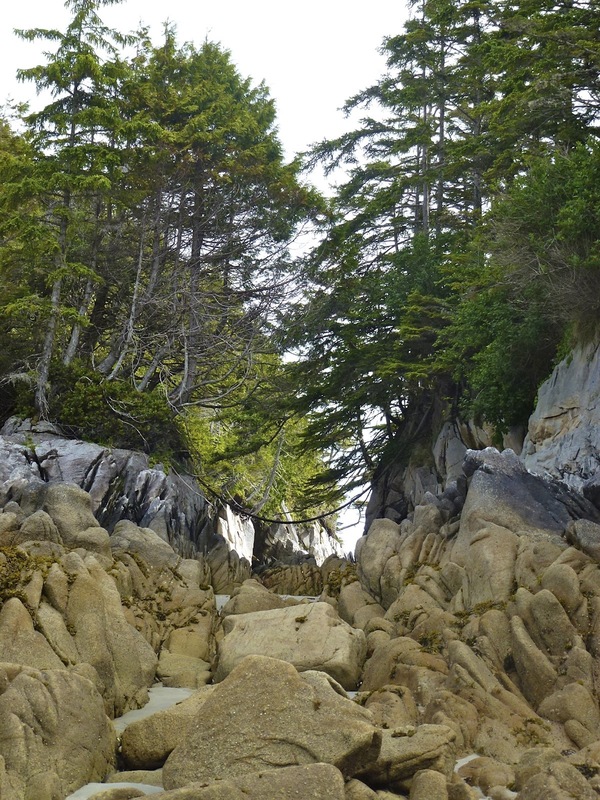 Calvert Island is the home to Hakai Institute- a privately owned centre for education and research. We were generously hosted there. Other artists in our group were hosted on the Columbia III and the Achiever; a sailboat owned by Raincoast Conservation Foundation. 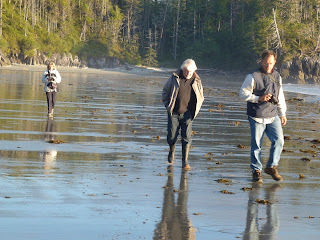 Each group saw different landscapes, due to the incredible diversity along our BC coast. Another group of artists are out this week- there will be 50 artists all together that are part of the Artists for an Oil Free Coast. We are very proud to be able to use our artwork to help the efforts to protect this precious wilderness area from the threat of an oil spill due to the planned Gateway pipeline project. There will be a travelling show of paintings, opening in Victoria around November 16th. I will post the dates again once they are confirmed. The Vancouver show will be at Performance Works on Granville Island in late November. I have already started my painting for the show and the coffee table book that will be produced. I am working from the photo posted here of the trees and rocks. Working large- 40 x 30". Will post the painting once it's finished. Not too much painting going on right now. We are into preparations for our trip to Calvert Island, which is north of Port Hardy and is the southern tip of the Great Bear Rainforest. We leave Monday, the 18th and return 6 days later. 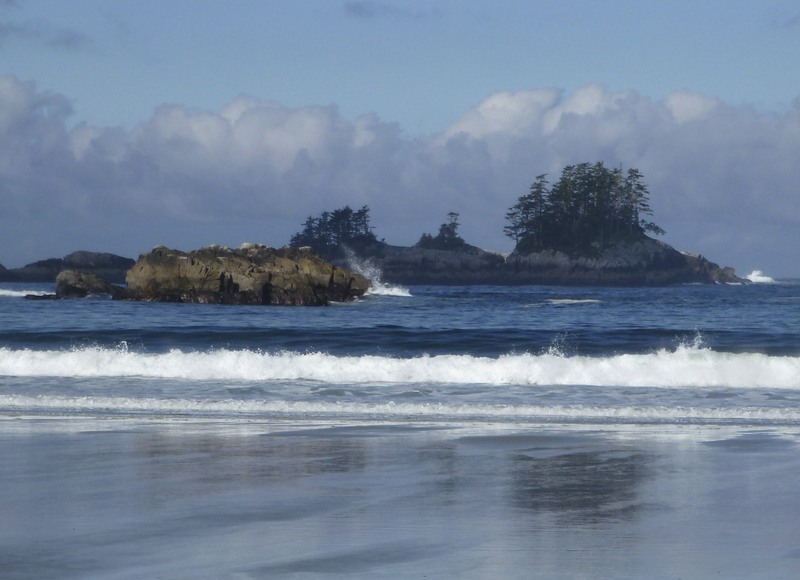 This trip is part of an ambitious event sponsored by the Raincoast Conservation Foundation and is the brainchild of artist Mark Hobson. Over 50 artists, all told, will travel to the region as a protest against the oil tankers coming down the BC coast as a result of the proposed Gateway Pipeline project. We will all paint or sketch on location and the result will be a travelling show and a coffee table book. CBC and Global tv are expected to be covering the event. The artists are divided into groups of about 12. Our group includes our friends, Mike Svob and Gaye Adams, as well as Mark Hobson and Robert Bateman. This is a trip of a lifetime for me as I have always wanted to go to this region. The challenge is to get the supplies down to a minimum, as we are quite restricted as to how much stuff we can take. I'm taking 9 x 12 masonite panels to paint on as that is the maximum size that will fit in my backpack. Also a small stool, easel, palette, paints, brushes and a collapsible water bucket. I will post photos from the trip when we return. 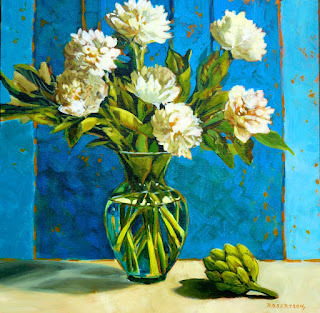 I delivered this painting to my Fort Langley gallery the other day. I think it's one of my favorites that I have ever done. I love the abstract quality of the background. 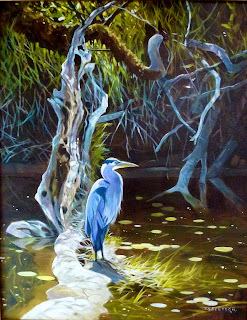 I never planned to be a wildlife painter, but I have always enjoyed painting big birds. So far, crows, seagulls and chickens have been the most common kinds for me- I like to paint what we have locally. 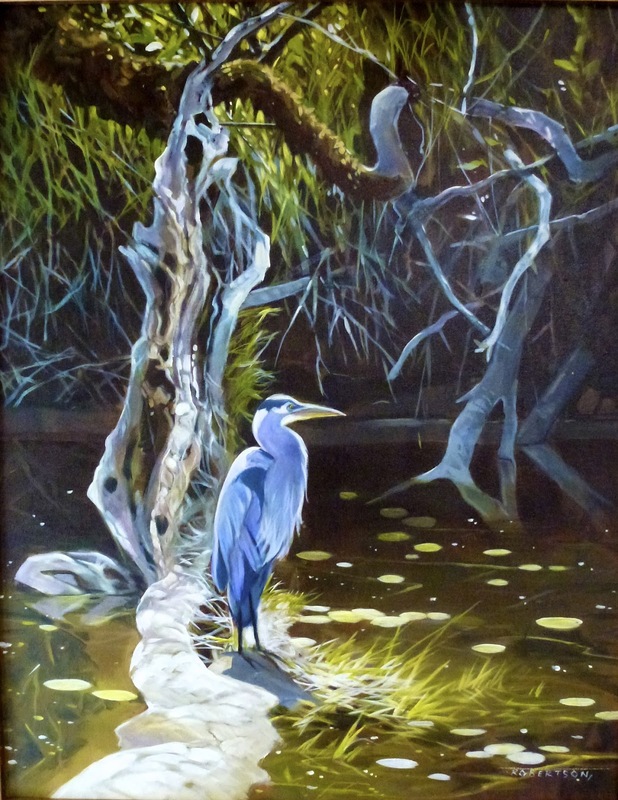 This is my second heron. Now I have a little vision of painting swans- love to paint white things. It might be too romantic, but if we ever get some decent weather I will go out with my camera in search of some good swan reference and see where that takes me. It's the same with the landscapes- I seem to need to paint what is familiar. I know that many artists enjoy painting images from their travels around the world. I've tried that and it never feels quite right to me. That could change, but for now, I find enough beauty and inspiration in what we have locally to keep me going for the foreseeable future. Here's the finished painting from the one hour demo that I did at Painter's Lodge last weekend. I'm experimenting with a background treatment that lets the quin gold underpainting show through- gives it a slightly weathered, textured look. Because this painting is so blue, I think it needs that little hit of orange to balance it.